Did you think black beans were the only ones getting in on the dessert game? With the holidays in full swing, Randall’s Great Northern Beans may have felt a little left out of the holiday cooking. 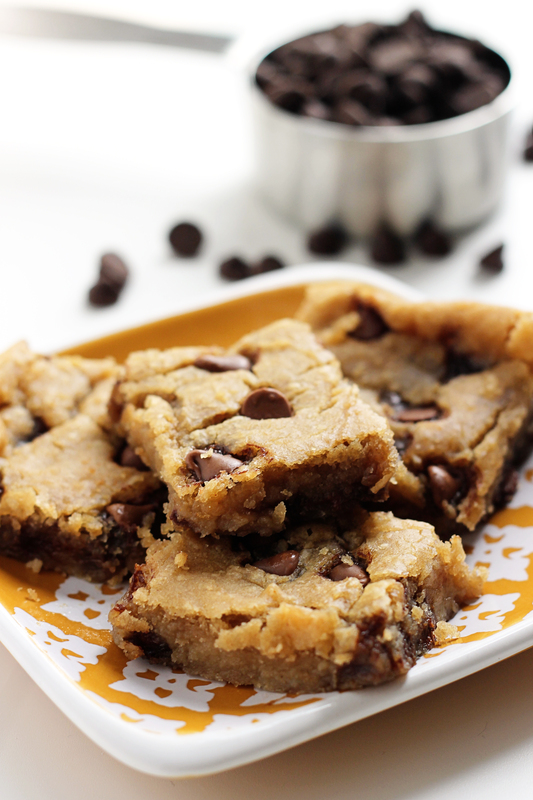 Thankfully, food blogger Nicole of Yes to Yum had the perfect solution with these scrumptious Chocolate Chip White Bean Bars. Somewhere on the spectrum between cookie and fudge bar, this dessert unlocks the full potential of Great Northern beans and gives the holiday gift of rich, bold and sweet flavor. Afraid to take the plunge on baking with beans? Fear not – chefs around the world have proclaimed the benefits of utilizing beans in desserts: less fat, with added fiber and protein, without sacrificing those sweet flavors you want in your dessert. In the season where you’re sure to have friends and family clamoring for desserts, what’s not to like? Once you jump the bean hurdle, this recipe leaves a lot of room open for changes. Sub white chocolate for the chocolate chips, halve the peanut butter portion and sub with your favorite cocoa hazelnut spread or add almonds or macadamias to the mix. When you open up to new ingredients, the dessert world is your oyster! Line an 8x8 baking pan with foil, making sure the foil overhangs on the sides of the pan. Later on, you’ll use the foil overhang to lift the bars out and cut. Lightly spray foil with nonstick cooking spray. Set aside. In a food processor, combine all of the ingredients excluding the chocolate chips. Process until smooth, scraping the sides if necessary. If you don’t have a food processor, you can use a blender. Stir in the chocolate chips and pour into the foil lined pan. Bake for 25­30 minutes, or until a toothpick comes out clean. Carefully remove bars from pan by lifting the edges of the foil. Slice into 16 squares and enjoy.